Throughout 2017 The Creative Well will present artist talks free of charge and open to the public in The McKenna Gallery at Riverbank Arts Centre. 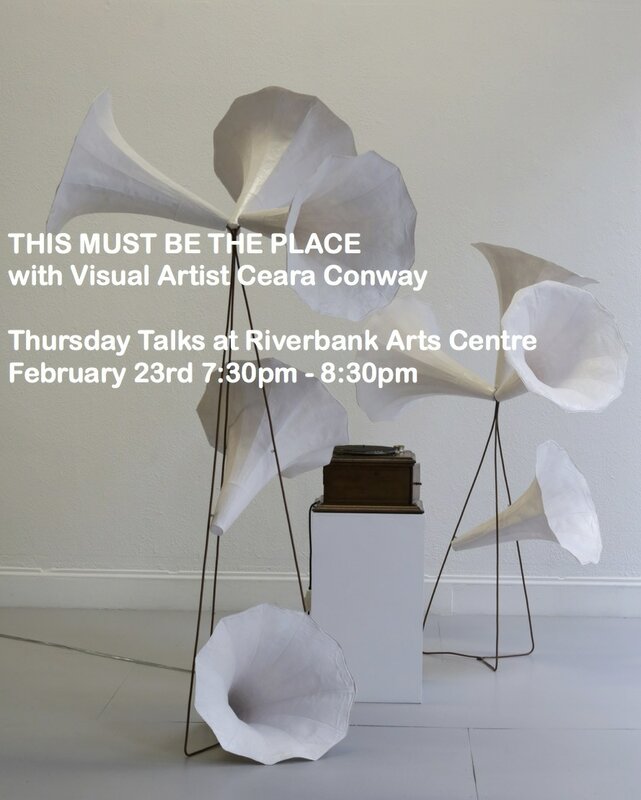 Ceara Conway is an Irish visual artist and singer with a multidisciplinary practice that utilizes visual arts, supported by methodologies from song, performance and traditional art practices. She is interested in creating site specific live performances that engage and move audiences. In her recent works she has explored social and cultural loss in response to themes such as colonial repression, death, exile and the Direct Provision System. Recent works include ''Breath'' Damer House Gallery, ''Time'' Ulster Museum and ''Dubh'' EVA International Satellite Events. Ceara has completed a number of commissions, residencies and public art works, including Thin Places (2015) Kings College, London; Vicissitudes (2013), Derry City of Culture and Making Visible, Irish Museum of Modern Art (2014). Since 2007 she has undertaken residencies with institutes such as Taigh Chearsabhaigh Museum, UK the OTIS College of Art/Suzanne Lacy, Los Angeles, USA, as well as numerous residencies in Ireland. In 2013 she received a Paul Brady scholarship from the Irish World Academy of Music at UL. She has also performed with Dave Flynn's, Clare Memory Orchestra, the National Gallery of Ireland and several music festivals in Ireland. Emer O’Boyle is co-founder and Director of UCD Parity Studios, Artists in Residence programme (www.ucdartinscience.com).She is an artist/educator whose work explores individual stories within collective contexts and creates conditions for exchange between different interest groups. Her projects have been funded by the EU Partnership for Peace Programme, Amnesty International, an EUFP7 project called GLORIA – Global Robotic Telescope Intelligent Array and The Arts Council of Ireland. Since 2010 she has been collaborating with Professor of Astronomy Lorraine Hanlon and her team at UCD.